Italy’s small island of Capri is situated on Amalfi’s eastern coast. 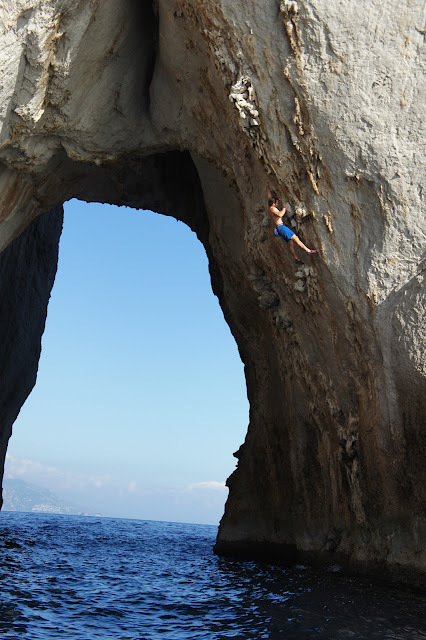 Recently Capri’s famous Lovers Arch has come to light with climber and avid Deep Water Soloer Michael Rolf making a new first ascent on the arch. Cleverly naming the 7a line after a local wine, ‘Tramonti’ climbs jugs and tufas to give a three stared climbing experience. 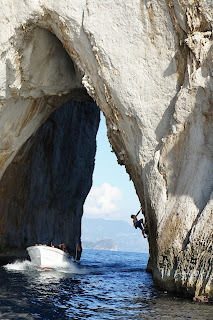 “You begin by hanging a blocky jug which is only reachable from a boat. Climb up until you have to make a long move left to some tufas. After climbing those you reach the first conglomerate holds after which you swing back right on huge jugs!!! Then make a final push through some difficult moves up to gain more tufas and finally some lovely big holds”. There are a number of other potential routes which have been spotted on the arch but haven’t yet been reported yet. There are additionally many other walls and caves in the area but mostly only accessible by boat which preserves these lines for the dedicated only!